Has any body read Chapter 35? for VK?!?! N do u know a anime is comin out for VK as well?!?! well if anybody knws where to read chap36 (cuz i cnt wait!) plz tell me! 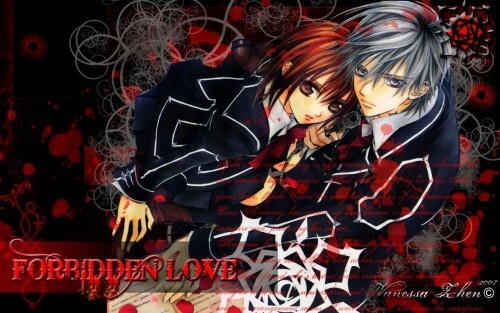 i made a Vampire Knight Wallpaper and decided to upload it onto the net so people around the world get a chance to see and use it! [b]please get it if you are a BIG,BIG,BIG,BIG[/b] fAN! Yes. I love VK and adore Yuki with Zero! Chapter 36 wont be out till 24/1/08. So still have to wait. I also cant wait! Very funky wallpaper! It look so nice! Do you have the scan? Pls do share too! You've made a good wallie! Zero and Yuuki is full of so much win. Nice work on the wallpaper. Love it. Awesome! i love this couple! love your wallie! i love yukixzero too! sooo cute haha can't w8 4 the anime! Love the colors.. Fit very well with these two. I love this manga very much! Thx for sharing! Great Job! YukixZero for life~! Especially what Zero does later on... you lot need to ease up, i mean whats the point anyway?